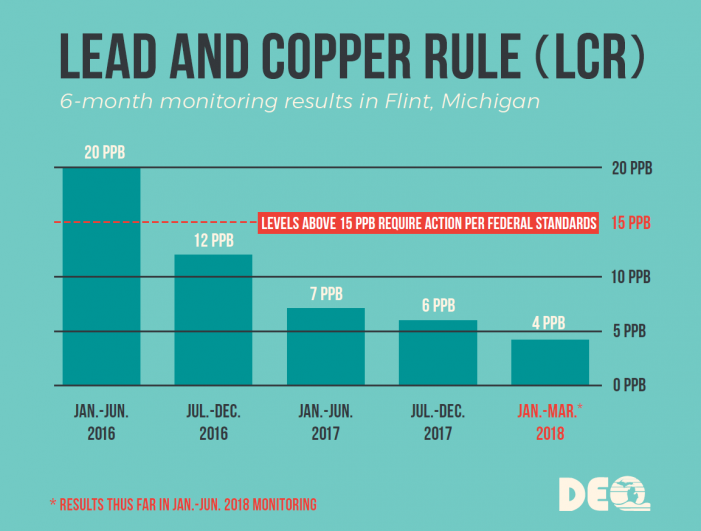 The city of Flint’s water quality has tested below action levels of the federal Lead and Copper Rule (LCR) for nearly two years, representing four consecutive 6-month monitoring periods, according to a report issued today by the Michigan’s Department of Environmental Quality (DEQ). Preliminary data for the first half of the current 6-month monitoring period shows that 90 percent of the Tier I (high-risk) samples collected are at or below 4 parts per billion (PPB), which is well below the federal action level of 15 ppb. Nearly two years of LCR data and thousands of other tests show that Flint’s water is testing the same as or better than similar cities across the state, according to state officials who announced that the remaining four distributions centers (PODs) will close and Access and Functional Needs (AFN) deliveries will end once the current supply of state-funded bottled water is exhausted. Water filters and replacement cartridges will continue to be available at City Hall and by calling CORE (810-238-6700 ) for residents who have service line replacements underway at their homes or would feel more comfortable using a filter until their confidence in the water quality can be reestablished. State taxpayers have provided more than $350 million to Flint, in addition to the $100 million from the federal government. The funding is helping with water quality improvements, pipe replacement, healthcare, nutritional food distribution, educational resources, job training and creation, and more. The 90th percentile lead value of samples collected from Tier 1 sites for the 6-month compliance period between July 1, 2017 and Dec. 31, 2017 was 6 ppb with 94 percent of the samples at or below the15 ppb federal action level for lead. Federal regulations require that at least 90 percent of tests come in at or below 15 ppb. A Tier I site is considered at higher risk per federal guidelines. This includes homes that have a lead service line or meet other criteria that make it an eligible location to determine compliance with the federal LCR. After the second consecutive 6-month monitoring period that ended in June 2017 with Flint’s water quality meeting federal standards, free bottled water distribution at the points of distribution (PODs) and Access and Functional Needs (AFN) water delivery were no longer required by the Concerned Pastors for Social Action settlement agreement that was entered in federal court in April of 2017. To allow residents additional time to prepare for the final transition to filtered water, in September 2017, Gov. Rick Snyder, Mayor Karen Weaver, Concerned Pastors for Social Action, and other community leaders came together and formulated a plan to continue the operation of four of nine PODs and AFN delivery. State teams have conducted extensive flushing and testing of unfiltered water at schools, day cares and elder care facilities, though there are no government regulations requiring the testing. The state of Michigan has gone above and beyond current federal regulations and meets proposed state regulations. Of the 2,540 unfiltered water samples tested at Flint Community Schools, 96 percent or 2,439 of the samples were at or below the 15 parts per billion (ppb) federal lead action level, 94.6 percent or 2,402 of the samples were at or below 10 ppb, 90.3 percent or 2,294 of the samples were at or below the 5 ppb bottled water standard and lead was not detected in 54.7 percent or 1,389 of the samples. Additionally, last November and December, state teams conducted flushing and testing at approximately 90 charter and parochial schools, day care and elder care facilities. Of the 831 samples tested, 98.6 percent or 819 of the samples were at or below the 15 ppb federal action level for lead, 97.6 percent or 811 of the samples were at or below 10 ppb, 95.1 percent or 790 of the samples met the bottled water standard of 5 ppb and lead was not detected in 80.9 percent or 672 of the samples. Water samples collected were unfiltered at all locations where it was possible to bypass the filter. State officials have previously conducted extensive flushing and multiple rounds of testing, replaced fixtures and installed over 1,400 filters in schools, day care and elder care facilities. MDEQ is working closely with any facilities that exceed the federal action level of 15 ppb. Tests that were above acceptable levels were at individual points of use within schools and do not reflect overall water quality within any school building. CORE (Community Outreach and Resident Education) team members have made multiple visits to homes where a water test hasn’t been submitted to encourage residents to have their water tested for free. Teams made over 8,500 contacts and provided nearly 6,000 water testing kits, with some residents passing on the opportunity to get their water tested. In addition to the residential water testing effort, CORE members have completed more than 483,800 visits at Flint homes and had over 153,000 conversations with residents to make sure they are properly installing and maintaining their filters and aware of available resources. Residents can call 810-238-6700 with questions about filter usage or to schedule a home visit by a CORE member. The CORE program was established to ensure Flint residents are properly installing, using and maintaining their water filters and are aware of available resources. CORE teams are comprised of hired Flint residents going door-to-door to assist fellow residents. Residents are reminded to ensure verification of official CORE credentials before allowing an individual into their home. Credentials include an official blue Flint Water Response Team badge with a security hologram, a GST MichiganWorks! badge with photo identification and a bright yellow vest. Team members will be ready to and are required to display their two pieces of identification at all times, and especially upon approach of a home.